Chippewa Valley Schools is one of Michigan’s fastest-growing and most progressive school districts, serving more than 16,000 students in grades K-12. The eighth largest school district of 788 public and charter schools in the state, the Chippewa Valley School district spans 28 square miles with 12 elementary, four middle, and three high schools. The district also runs two ninth grade centers, an international academy, and a preschool center. For the Dell-EMC Chippewa Valley Schools Case Study, please click here. With increasing volumes of video evidence, law enforcement agencies need to understand the tradeoffs involved in making decisions that can resonate over many years. It is apparent that law enforcement agencies are now storing more video evidence from body cams, drones, in-car video cameras, and crime scenes. With so much video data being created, it has become a challenge to understand how best to address the needs of law enforcement, comply with legal requirements, and address costs and convenience at the same time. Large-scale deployment of body cameras is still a relatively recent development for most law enforcement agencies. Although it is convenient to start using the cloud-based storage provided by the video camera vendors, it is important to understand the long-term implications of doing so for law enforcement and IT. Storage of body camera video evidence is different than storage of regular files, email, or even regular photographic evidence. Evidence cannot be easily stored in the cloud, like email and word processing can, due to regulatory compliance requirements such as data sovereignty. Hybridor on-premises storage uses will help address the range of these requirements related to location. Silos of video information from different sources reduce collaboration unless they are combined into a shared surveillance data lake. There are many considerations when adopting a solution for storing video surveillance and evidence data collected from devices such as body-worn cameras. It is important to understand the concerns for IT organizations and for the broader set of law enforcement agencies evaluating storage. What criteria do IT decision makers consider when evaluating storage solutions or vendors? In 2015, ESG conducted a research study investigating the general storage industry that surveyed 373 IT decision makers. We’re excited to attend the IACP Annual Conference and Exposition in San Diego this week on Oct. 15-18. Each year, thousands of dedicated professionals from federal, state, county, local and tribal agencies attend IACP to learn about the newest intelligence, strategies and tech solutions available to law enforcement. Among the topics likely to attract attention and spark discussions are body cams and the importance of gathering electronic evidence. With an overwhelming 99 percent of public safety experts agreeing that video surveillance technology will play a significant role in their ability to prevent crime, theft and terrorism over the next five years, it’s more critical than ever to ensure we’re utilizing video data to its potential. The increase in video data means there is a massive potential for enhanced situational awareness and better intelligence – but only if the data is analyzed. In honor of the IACP’s 123rd year, we’re sharing tips to help make selecting on-premise body cam storage and management as easy as 1, 2, 3. While body cams are certainly getting their share of coverage lately, it’s important to remember body cams are just one component of the video data that public safety departments are tasked with managing. Today’s public safety environments also consist of video, surveillance cameras, drones, in-car video, mobile devices and more. Progressive public safety departments must build a data platform that can collect, store and manage these individual pools of data. A common infrastructure provides a more cost-effective storage environment, more control of the data and better security. Last month, the Associated Press reported police departments in Indiana and Kentucky have halted the use of body cams, citing new laws that would require the video to be stored longer and thereby significantly increasing the cost. On average, each body cam requires a minimum of 1TB of storage per year. Competing cloud solutions charge over $1,400/year – per camera. For a police department that has 500 body cameras, that can quickly add up, with the cost of storage for body cams totaling approximately $700,000 annually in perpetuity. Department heads trying to maintain budgets and plan for additional personnel to monitor the data should consider alternative storage solutions that cost considerably less to deploy and provide an overall better total cost of ownership. Open platform enables departments to integrate body cam data with the best available industry applications. To avoid the risk of limiting video to a single company’s platform, departments should bypass a closed solution as it may prevent other key applications gaining access to that data. Because the video world is constantly changing, an open platform will enable departments to implement the best solutions today and tomorrow. Read more about our storage solutions here or visit us at Booth 820 and Booth 5307 at IACP. We look forward to seeing you there! SecuritySolutionsWatch.com: Thank you again, Ken, for joining us today at this very exciting time. Since our previous chat a few months ago, Dell and EMC have completed the biggest technology merger in history. On August 30th, Michael Dell, chairman and CEO of Dell Technologies said,“This is a historic moment for both Dell and EMC. Combined, we will be exceptionally well-positioned for growth in the most strategic areas of next generation IT including digital transformation, software-defined data center, converged infrastructure, hybrid cloud, mobile and security.” Care to elaborate on this? Ken Mills: I am very excited about the value Dell EMC will bring to the surveillance and security market. Mr. Dell has discussed on a number of occasions that Dell EMC is a 1 + 1 = 3 opportunity for our customers and partners. This is especially true in the surveillance market. Dell EMC brings together the industry- leading server portfolio from Dell, the industry leading virtualization platform from VMware, and the 5-time surveillance market leader in surveillance storage from EMC. The surveillance industry is rapidly moving to the datacenter and we are hearing more and more that our customers want open, scalable and reliable enterprise infrastructure for their surveillance compute and storage. Adding Dell’s server, networking and OEM portfolio to EMC’s edge to core to cloud storage architectures provides customers a validated end-to-end solution for surveillance infrastructure. Combining Dell with EMC will provide our joint customers more choice and more value than on our own. 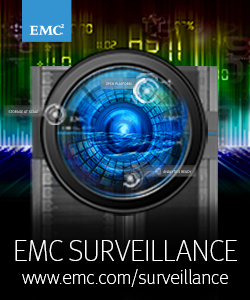 Dell EMC will reduce the complexity of deploying large scale surveillance solutions. SecuritySolutionsWatch.com: Can we drill down a bit into the newly combined technology portfolio and the solutions Dell Technologies delivers? Ken Mills: As you know from our previous discussion, EMC already offers industry leading surveillance solutions at the edge with VNX, in the core with Isilon and in the cloud with ECS, Virtustream and our Service Provider Partners like Atos and AT&T. As we move forward as Dell Technologies, we will be adding validated solutions across the Dell Technologies portfolio. Specifically, we are already updating our reference architectures to include the Dell enterprise compute portfolio. We will are also already working with joint OEM partners to find opportunities where the Dell and EMC portfolio will expand our partners’ ability to deliver best in class surveillance solutions for our customers. Our partners and customers want simple but validated surveillance solutions. Adding Dell to the portfolio will ensure we continue to deliver on this expectation. SecuritySolutionsWatch.com: Please walk us through the online resources that are available for the Dell community and EMC community? Ken Mills: You will continue to find the latest surveillance specific information at http://emc.com/surveillance . We have also launched a public surveillance focused blog at http://vigilareblog.emc.com . In addition to the public facing website and blog, you can often hear the latest about surveillance on The Source podcast hosted by Sam Marraccini at http://thesourceblog.emc.com/ and on iTunes. SecuritySolutionsWatch.com: In the coming months we look forward to learning more about Dell Technologies. Can you give us a sneak peek of the topics you’ll be discussing next month and in the months ahead? Ken Mills: We are excited to expand our portfolio and bring even more surveillance solutions to our customers around converged infrastructure, virtualization, networking and the cloud. It will be an exciting year for Dell EMC and surveillance. More to come….